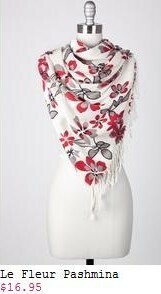 $15 for $30 Worth of Scarves, Shawls, Pashminas & More! Only $12 for New Members! Scarves from $6.95! Eversave is selling $30 vouchers (which can be used instantly) to Scarves.com for only $15! Even better, new members get an instant $3 credit, allowing you to get one for only $12! 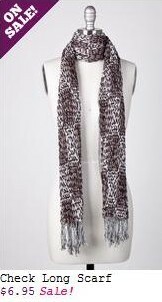 The vouchers are valid for the entire Scarves.com site, which includes wraps, hat/glove/scarf sets, shawls, pashminas and much more. There's even a men's section! I checked out the site to see exactly what can be bought with $30, and turns out, you can get quite a bit! There is a large selection in the "On Sale" section, with scarves starting at only $6.95. You could get 4 scarves for as low as $12. That would be an easy way to cross a few names off your gift list!